Same Actions – Different Faces John Heartfield collages seem like comments on current events rather than warnings from when 20th century fascism was on the rise. He shows us war and misery result when politicians are for sale. 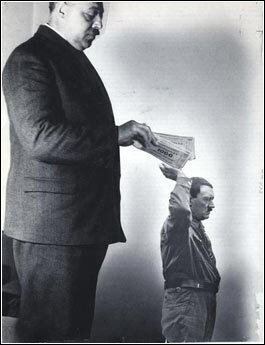 The world needs John Heartfield’s art more than ever. Powerful Artists Reveal Art Collage, Writing, Video, Music, & New Media by contemporary artists inspired by the life and work of John Heartfield. These artists have the courage to challenge authority and experiment with new form of expression. Dada Art and events that happened in San Francisco November 3-13, 2016. Video of the curator’s presentation on Art & Politics – Politics & Art in The Collage Museum. 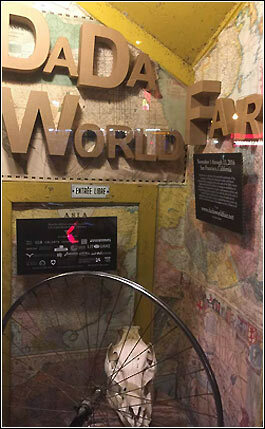 The Dada World Fair was sponsored by San Francisco’s City Lights Bookstore. A 2016 Austrian Political Art Event. 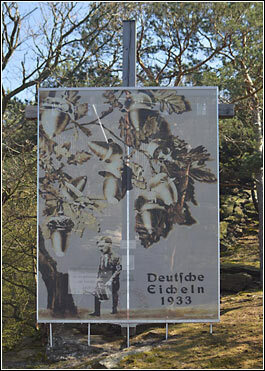 A metal and fabric version of the Heartfield collage Deutsche Eichlen permanently installed directly in front of a Nazi war memorial. Artists and historians supported by Austrian government officials. View and read the inspiring story of Mahnmal Friedenkreuz St. Lorenz. 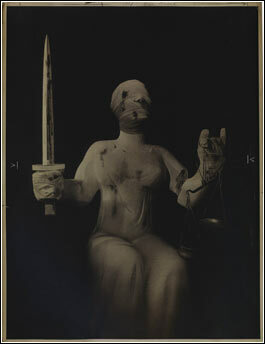 The late David King was a great friend of the John Heartfield Exhibition. His Heartfield collection is on display in The John Heartfield Gallery, Tate Modern London. This section highlights text and the images in David’s fantastic book, John Heartfield, Laughter Is A Devastating Weapon. The Heartfield Exhibition Shop offers the highest-quality posters, t-shirts, and mugs. We’re always expanding our selection and products. We’re currently adding merchandise featuring images from the new REVEAL ART section. Profits from the shop go towards improving and expanding your experience on our website. Write To Us if you’re looking for a particular image or item. Powerful Art Isn’t Words On A Teleprompter. Powerful Art Persists Long After The Daily Nonsense. Help Us Present More Artists Taking Action. The Official John Heartfield Exhibition is financed by his grandson. The exhibition needs your help to continue to promote art that inspires political action. 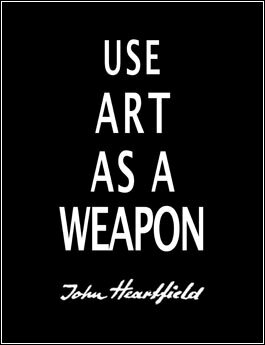 The Official John Heartfield Exhibition is a Political Art Museum that displays Art As A Weapon against bigotry, ignorance, and senseless war.Write To The Curator to contribute your talent (of any kind) to The John Heartfield Exhibition. [Powerful works of political art…] extend beyond political current events, allowing the viewer to develop his thoughts, imagination, and sensual perceptiveness. The fact that the current political trend has not faded is assured by reality itself, which tries even nowadays to live up to the satirical montages in a violent and impertinent manner. We heard countless words during the 2016 United States presidential election. We heard Donald Trump say things that had never been said before by someone hoping to be the most powerful person in the world. Ugly things. The very next day, we were told he would “pivot” in order to present himself as a reasonable acceptable leader. This “pivot” consisted of Trump poorly reading words on a teleprompter that were written by political hacks. Hillary Clinton may have been the most qualified person ever to run for the presidency. She tried to appear as a heroine of the people. Just as quickly, the media portrayed her as a bumbling threat to US national security because she used a private email server. Before the U.S. election, the disastrous Brexit passed in the UK because many people were convinced that Brexit meant that immigrants would have to “exit” Britain. In France, propaganda is leading to the rise of the extreme right-wing. Propaganda is the art of using lies to convince someone or some group of people that something very bad for them is actually very good for them. The most powerful political art reveals the truth behind propaganda. Powerful art doesn’t pivot. Powerful art explores new techniques to reveal art as an ever-changing landscape. In a real sense, all John Heartfield art was “Art As A Weapon.” He embraced Dada to rebel against portraits and landscape. Dada was a weapon against the art Dadaists felt cooperated with the corruption of the Weimar Republic. His book covers rebelled against the concept of a meaningless book dust jacket. His use of “art as a weapon” against fascism, Adolf Hitler, and The Third Reich earned him the number-five position on the Gestapo’s Most Wanted List. CURRENT EXHIBITS presents more art that reveals the lies behind the propaganda. Art by contemporary artists who find inspiration in the work of John Heartfield. Art that takes risks. Art that doesn’t pivot, but remains true to the courage of the artist. Join Our Mailing List for occasional important updates and a discount in The John Heartfield Exhibition Shop. We never send out spam or share your information. Visit the exhibition’s social networks for important updates.